Finally, a mechanical disc brake that offers superior performance and is a snap to set up. The Spyre is a dual sided mechanical where both pads actuate providing even and precise clamping force. This translates into even pad wear and, with the addition of a simple cable barrel adjuster, the pads can be adjusted easily and hassle free. No frustration at completely adjusting the whole caliper, only to have it continue to drag the fixed side, adding wear! All of this in an incredibly thin 40mm wide, 154g slender package that works with any of the drop bar levers on the market. Works with ALL cable actuated road levers. Compressionless housing highly recommended. Bought this to replace a post mount brake and it has made such a difference. Very pleased with it and as usual, great service from Merlin too. 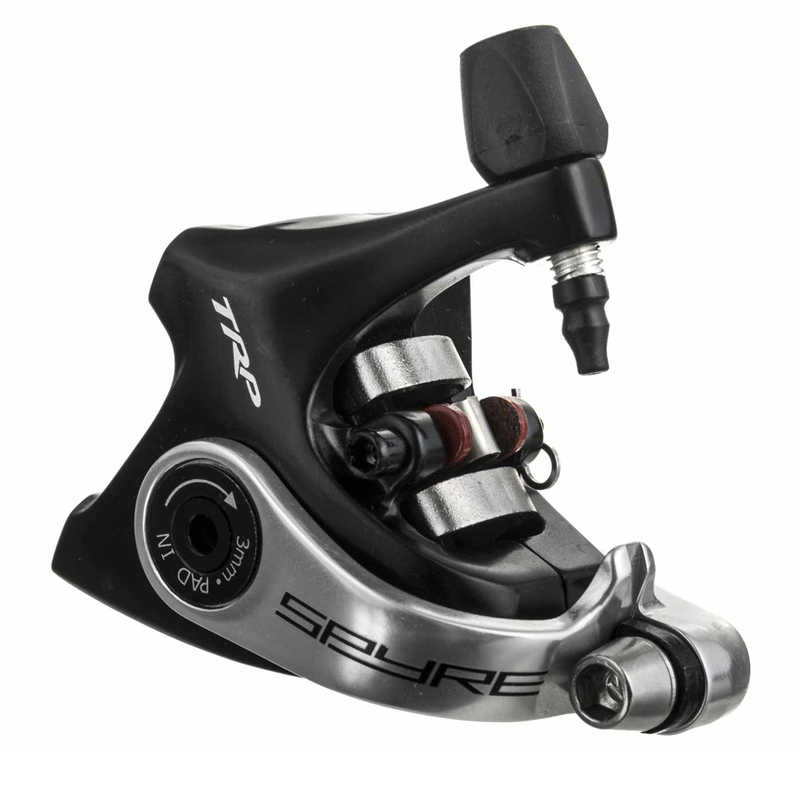 Good engineering, I have good experience with Spyre post mount disc callipers. Excellent value for money. Flat mount version does not come with mounting brackets, these are sold separately. This is my second build using this model. I prefer this over the more expensive carbon model. Upgraded to the Spyres from single sided calipers. These make a big difference in all things braking. There is actually modulation now and a much stronger braking force. A side benefit is they are also quieter than the old calipers. Would absolutely recommend for anyone looking to upgrade their stopping. A great alternative to hydraulic brakes, without the mess and hassle of hydraulics.. Easily fitted and the dual piston action makes them easy to adjust and maintain. Less spongy than road hydraulics with good bite and modulation. Recommended. It's the best mechanical brake you can get. I've built three bikes with these brakes and I am quite satisfied with the brake power. Also the weight is pretty low (claimed to be a little under 150grams, mine are around 160grams). I have used the post mount version of these for a couple of years now and they`re great. These flat mount are just as good and are really easy to setup and maintain, they`re powerful enough for my needs and with no snatching when brakes are applied, just a smooth controlled stop. The pads are also widely available from different manufacturers and also reasonably priced. Really happy with these and would highly recommend.